I have been consuming all the great additions to Flash 10 this weekend and one that really jumps out after you get past the visual, text and sound features (which are spectacular btw and most of what the community was asking for). But one feature snuck by, this is the one that ByteArray (Thibault Imbert) mentions/pointed out for managing files directly within Flash. This greatly lowers the bar to using Flash as a photo editor, document manager, customized application experiences, marking up content and saving locally, all without the need for server side script. I am a big fan of server side technologies and develop with them but even for bettering performance this could be huge. Scenarios where this might be useful is editing applications, note taking (download a book with your notes), editors for docs/games/3d/textures,,, the possibilities are endless really. Flash 9 just got mainstream and production ready (flash 9 penetration) at the tail end of last year but there are so many great things in the new version that I hope it comes out very soon. Flash it turning into quite a platform. Alternativa Platform also has updated their engine for Flash 10 already (they must have had some inside early accessibility to it) and there are great possibilities here. It is only beta (Flash 10) but there are great market opportunities to prepare for when this launches. Keep your eye on where the puck will be, not where it is currently at. I was concerned when Adobe bought Macromedia and the future of Flash but it appears they are taking this bull by the horns. If you are ready to play with Flash 10 here is Flex and FlashDevelop updates to help you get started. 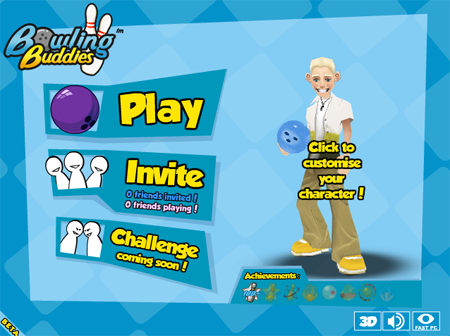 The Bowling Buddies game is made by the very creative Playfish.com company (more on the release at their blog). They have some great facebook/social network games combined with flash. With bowling buddies they created a game similar to Wii bowling (even with customize characters) and the best part is how they have scaled down versions. You can play in 2D, 3D and at different levels of quality to make it accessible to everyone. I think that will probably be needed with 3d flash games (Shockwave Director has LOD (Level of Detail) that helps with scaling down to slower machines but you have to do that yourself with the state of 3d engines in flash so far). 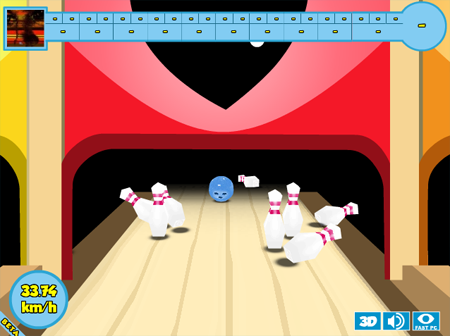 Bowling buddies and most playfish games are Facebook/Social Network based. You might say, why? (especially if you aren’t in the US where facebook is the biggest social network). But even Activision’s CEO calls facebook a threat to online gaming as we know it, this is because of the community aspect and the ability to play with friends and multiplayer games easily. Rather than setting up your own player find mechanism, facebook has it built in and all the viral aspects you need to garner more fans. So those into facebook and gaming are possibly ahead, but also it will be extremely competitive. 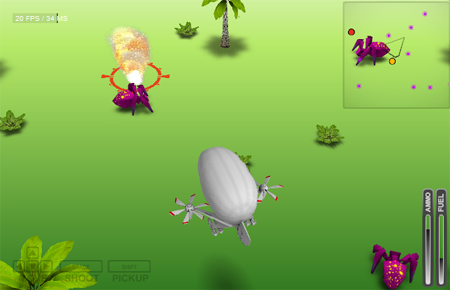 Airship is a really creative game that has been impressive to watch grow over the last weeks. It is now textured and performs pretty well. The best part is the Airship model and the fans. Very neat and I hope this one is seen through to a launched game. It is a bit like a RTS/Strategy overhead game that would be very cool to play multiplayer with Red5 server as well (just need the TIME!). The best part is you can see after a year+ of release papervision and the other 3d engines are really changing the way gaming is done online. What was once a Java or Shockwave only capability, flash now has with evolving 3d engines, and there are playable fun games to prove it that are commercial ready.